Istanbul. 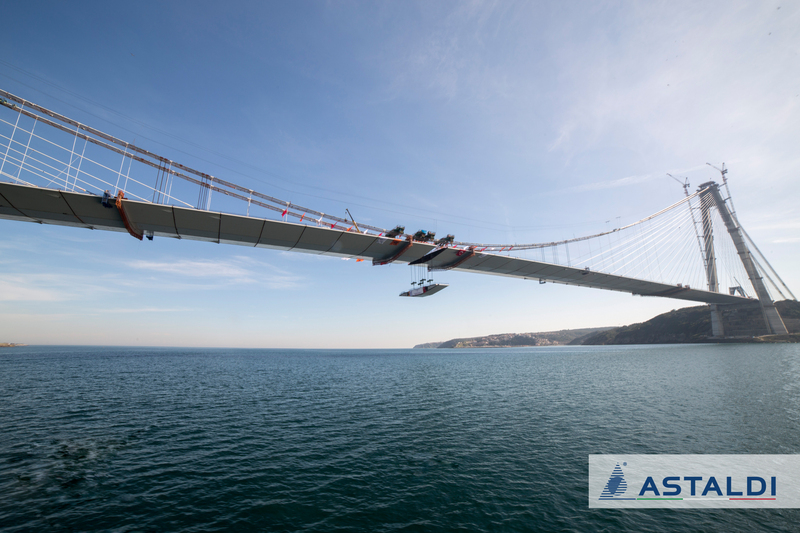 Since yesterday, Europe and Asia have been linked by the Third Bosporus Bridge. Construction began in 2013, and the final key segment to close the deck was welded in place yesterday. It is a bridge of records: the world’s only suspension bridge with a deck accommodating an 8-lane motorway (4 lines in each direction) separated by 2 railway lines, all on the same level; the world’s widest suspension bridge; the suspension bridge with the tallest “A”-shaped towers in the world. The hybrid cable-stayed suspension bridge is 59 metres wide, with a 1.4 kilometre span between the towers – the equivalent of eleven soccer pitches end to end. Its two towers soar to a height of 322 metres – taller than the 300-metre Eiffel Tower. The Third Bosporus Bridge is part of a larger project, The Northern Marmara Highway Project, that calls for building a total of about 190 kilometres of motorway. The works, carried out with the BOT (“Build-Operate-Transfer”) formula, involve a total investment exceeding US$ 3 billion, funded through project finance. Since the 1980s, Astaldi has been a presence in Turkey, where it has already built a section of the Anatolian Motorway (116 kilometres, between Gumusova and Gerede), the Istanbul underground (26 kilometres and 16 stations, opened in August 2012), the international terminal of the Milas-Bodrum Airport (constructed in just 15 months and operated through October 2015), and Istanbul’s Haliç Bridge. The Group is currently engaged in completing the more than 400-kilometre Gebze-Orhangazi-Izmir Motorway and the Etlik Integrated Health Campus in Ankara, one of the largest healthcare complexes under construction in Europe.